Do you have an old Mac running Mac OS 9 laying around the closet? 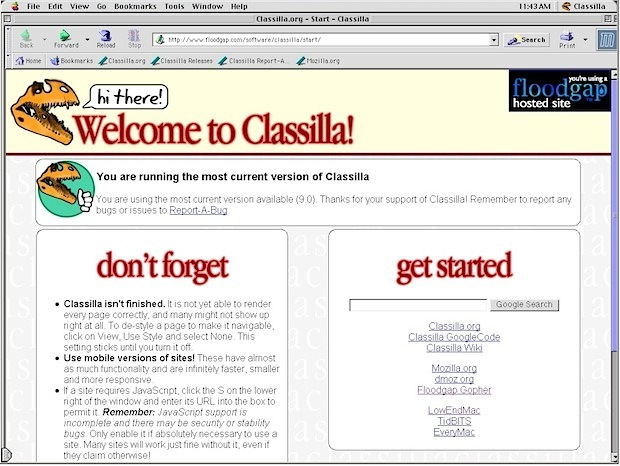 Dust it off and bring it into the modern age (of the web at least) with Classilla, an open source port of Mozilla, the same underpinnings of Firefox. 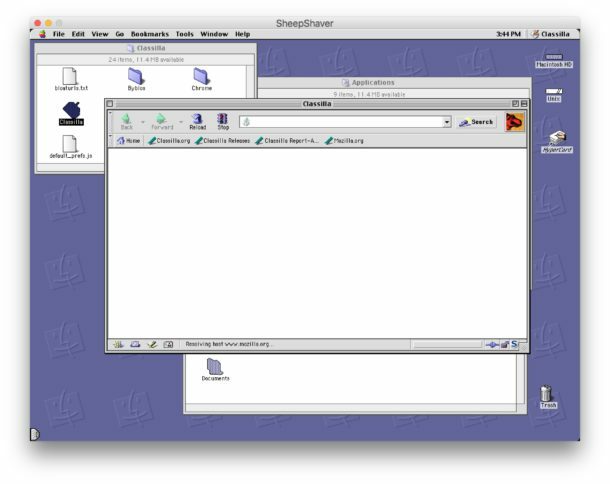 It’s a work in progress so don’t expect it to be perfect, but alongside iCab it’s probably the best web browser option available for the classic Mac environment, and it works great for getting on the web in Mac OS System 9. Requirements are basic enough to run Classilla: PPC processor, 64MB of RAM either virtual or physical, 50MB of disk space, and Mac OS 8.6 or later, although Mac OS 9.1 is recommended along with a G3 CPU. If you have a different generation older Mac and you’re feeling left out, you might still be in luck. For those PPC Macs running older versions of Mac OS X, don’t miss TenFourFox, a modern FireFox port for older pre-intel Macs running 10.4. Know of any other handy classic Mac OS tools or apps like this? Let us know in the comments. Something for System 6 or System 7 perhaps? Do share! You’re talking about an operating system from the 90s?!? What’s the download count? 12? 13? I use this on my Power Mac regularly. OS 9 is better than X in many ways. Mostly the UI, but also in the ability of extensions to modify the system. Yes, they could cause your Mac to crash if you had a conflict, but in all the years I used Mac OS 8 & 9 that never happened to me. Oh yeah, one more thing… Kaleidoscope! I am viewing this page with my PowerPC G3. Yes, it’s 2011. I am a Mac collector. I’ve even browsed the web on the Blue and white clam-shell iBook and Macintosh Classic. I take them to coffee shops and people stop by to ask questions. It’s fun, like collecting old cars. Wasted effort? I’d say OS X Lion is wasted…on me anyways. Monkey swipe gestures for a computer that isn’t a touch sensitive machine? Definition of stupid. There is nothing inherently wrong with OS 9…yes, its old, but the software written for it works as well today as it did when it was written, and much of it now is considered “abandonware”, ie free for the taking. I have fondness for OS 9 but it’s very creaky and ancient compared to OS X.